This interview is a translated version of the interview that was first posted on August 9, 2011. Today, I would first like to ask about Pokédex 3D1, available as a free download from Nintendo eShop2 for the Nintendo 3DS system. I’ve asked to use a meeting room here at the head office of The Pokémon Company3 so we could have this opportunity. Thank you for coming. 1: Free downloadable software for the Nintendo 3DS system available via Nintendo eShop in Europe since June 7th, 2011. It allows players to view the new Pokémon that appear in the and games from whatever angle the players like in 3D. 2Nintendo eShop: An online service that allows users to download games and enjoy videos such as commercials and trailers. 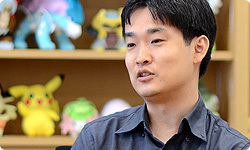 3The Pokémon Company: In addition to brand management of Pokémon, the company operates six Pokémon Centers around Japan. Founded in the year 2000. Headquarters: Tokyo. 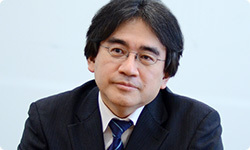 First of all, I would like to ask what you worked on during development of Pokédex 3D. Ishihara-san, let’s start with you please. Alright. To start with, I had a strong image of what kind of software we wanted to make. This project started based on your proposal. That’s right. This time, I was involved in very different ways depending on the areas - from offering opinions on what I wanted to do with incredibly detailed parts, to broadly leaving some areas to the decisions of the staff members. You do have great range in the way you oversee your projects, and it was Creatures4 who took your requests and made the software. Would you please introduce yourselves? Let’s start with Ogasawara-san. 4Creatures Inc.: In addition to developing games in the Pokémon Ranger series (Nintendo DS) and the game PokéPark Wii: Pikachu's Adventure (Wii), this company produces the Pokémon Trading Card Game and many other games. Headquarters: Tokyo. 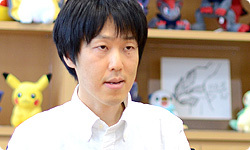 I’m Ogasawara, one of the programmers. In addition to deciding overall policy, I wrote rendering-related programs. 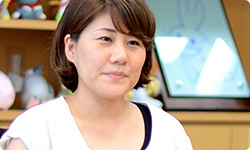 I’m Takeuchi, one of the designers. 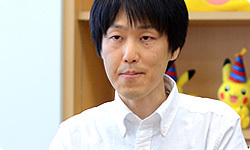 Together with Ogasawara-san, I was mainly in charge of rendering the Pokémon’s 3D parts. I also made requests about the specifications I wanted to another team that was working on the modelling and motion data. Once I got the data from them, I would work on adjusting it so it would run on the Nintendo 3DS system. I’m Orimoto. 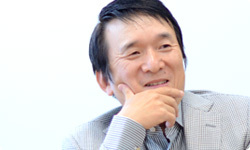 I worked creating programs under Ogasawara-san. The main part of my work this time was the program related to AR (Augmented Reality)5 that makes it possible to take pictures of Pokémon in the real world. I also worked on details such as the UI (user interface) and visual effects. 5AR (Augmented Reality): Technology for inserting virtual information into images of reality. You’ve been looking into AR for quite some time. In the days of the Nintendo DSi system, you showed me something that you were experimenting with on a personal computer. 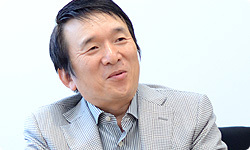 Ishihara-san, earlier we mentioned that development began when you had an idea of what kind of software you wanted to make. What kind of an image did you have in your head at first? Last year, the Pokémon Black Version and Pokémon White Version 6 games came out, and this year the Nintendo 3DS system went on sale, so I thought we wanted something that you would be able to enjoy using all the new Pokémon that appeared in Pokémon Black Version and Pokémon White Version along with all the new features of Nintendo 3DS. To figure out what kind of product to make, we tried all kinds of things, and in the end we settled on the form of Pokédex 3D. 6 Pokémon Black Version and Pokémon White Version: The most recent games in the series, released for the Nintendo DS system in Europe in March 2011. Your original inspiration was showing the new Pokémon that appeared in Pokémon Black Version and Pokémon White Version on the Nintendo 3DS system. That’s right. That’s how it got started. Then we began making it, considering the various possibilities - like the SpotPass7 feature - for sending and receiving content. 7SpotPass: A feature in the Nintendo 3DS system that when activated receives various information and content just by being near a wireless LAN access point. Ogasawara-san, when you got that broad request from Ishihara-san, what did you think? First, I thought we would make a book. That was about the time digital books were becoming a topic of conversation. First, I thought we would see how well we could create an illustrated guide to Pokémon on a gaming device rather than on paper. When you compare paper books to digital content on a gaming device, they each have their advantages and disadvantages. That’s right. Paper books have the merit of being a larger size and therefore are easier to look at than the LCD of the Nintendo 3DS system, but it isn’t easy to lug around a thick book. Software for the Nintendo 3DS system, however, has the merit of being able to pack in any massive amount of content. So we thought about making software built into the Nintendo 3DS system. That way, if you had the Pokémon Black Version or Pokémon White Version Game Card in your Nintendo 3DS system and wondered what a particular Pokémon was, you could just run Pokédex 3D and look it up right away on one single machine. As built-in software, you could start it up immediately whenever you needed. That’s how much we were turning over ways to deliver this software to players. Of course, there was a way to put all of the Pokédex 3D contents on a Game Card, and we wouldn’t have had to worry about the volume, but if it took up a slot, then you wouldn’t have a place to put Pokémon Black Version or Pokémon White Version. If you did that and you wondered what a certain Pokémon was, you would have to switch cards, which would be inconvenient. That’s right. Then we decided to distribute it via Nintendo eShop, but Ishihara-san’s first order was to make it downloadable in a mere three minutes! No matter how you look at it, there is no way to download a Pokédex containing all 153 Pokémon from Pokémon Black Version and Pokémon White Version in just three minutes. Editor’s note: This interview is a translated version of the interview that was first posted on August 9, 2011. 16 Pokémon , and then you can download the rest on a daily basis using SpotPass. That way, up to three Pokémon can come in each day. That’s right. But we made it so that the order in which the Pokémon come in isn’t the same for everyone. I do feel that since distribution began people are actually talking about what has come in each day when they open up their Nintendo 3DS. It’s sort of a letdown when you can’t seem to get one of your favourites. However, not all 153 Pokémon come in through SpotPass. About the time you pass 100, just waiting isn’t enough to get the final ones. Are those that won’t come in different for different people? Yes. You may get Pansear, but not Panpour. It’s different for each person. Then you can trade with your friends. Although it isn’t really trading this time so much as copying. Oh, I see. You usually trade in Pokémon games, but this time, it’s like a book, so you copy. I hope people will share a lot, in place of downloading. There are benefits to that. If you get a Pokémon from a friend, there are little differences, like the addition of a button for pausing the animation. It is very like other Pokémon games, in that what you get from a friend is superior. Yes. That is an important element in Pokémon games!